This one is for my cousin, Jared.....I love you!!! 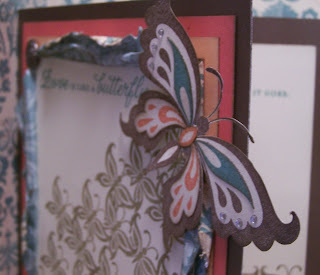 Another card using the March SOTM, Butterfly Wings. This card could be for just about anything....LOVE, of course, FRIENDSHIP, or even GOOD LUCK! Circles, rings, scalloped edges, arched stamps—the papercrafting world turns topsy-curvy in this episode of Art & Soul. Discover how easy it is to create darling circular accents and images using My Acrylix® stamps, the Coluzzle® circle template, and a little ingenuity. Your head will be spinning with fresh ideas after watching this enjoyable and informative episode! I just LOVE Easter....all the pretty little dresses and the cute little sweaters and ties for the kiddos!!! But most importantly, the great promise that it signifies!!! Knowing that I can come to God with my basket full of sins and He will forgive me and I will live for eternity next to all the people that I have loved and lost and those that I will greet anew. My basket runneth over....and I can still be forgiven! 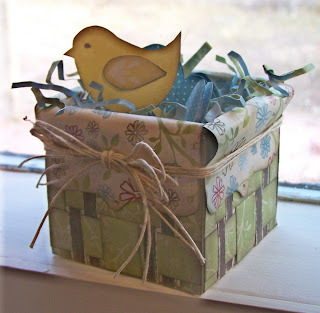 This mini Easter Basket doesn't contain sins (how un-fun would that be)...it contains a cute little birdie and her eggs. It's made using Angie Kennedy Juda's template and inspiration from MJ Albright. It measures about 3x3 and I chose not to put on handles but it would be cute either way (might try another one with handles later). 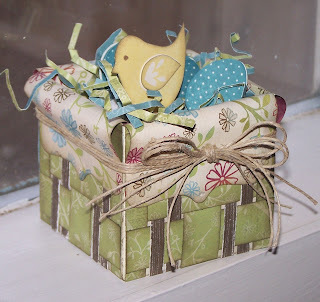 The paper shreds in the basket are 1/8" x 12" cut pieces of B&T from the Emporium Paper Packet and then I accordion folded them to resemble the shreds you can buy by the bag in the gift wrapping section of most stores. 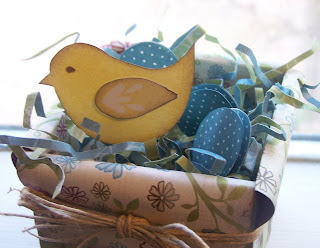 I stamped the eggs, cut out and then stamped on the back....there are two two-sided eggs adhered together by a 3-D Foam Square to give it a little bit of a dimensional look. 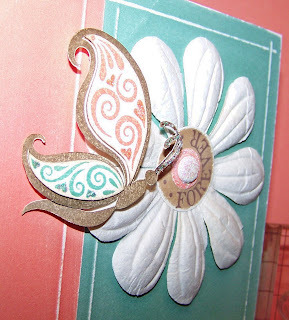 The little birdie is stamped using Buttercup ink and then her little wing is actually 3 wings stamped, ink distressed, and adhered together (I thought a 3-D Foam Square would be too much). 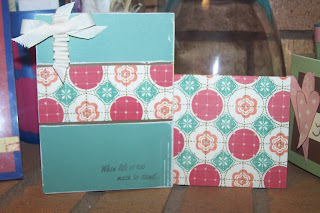 The basket weave is a combination of 3/4" x 3" pieces, 3/4" x 2-3/4" pieces and cocoa cardstock that measures 1/4" x 2-3/4". I weaved them together and then adhered the weaved pattern to the basket base. 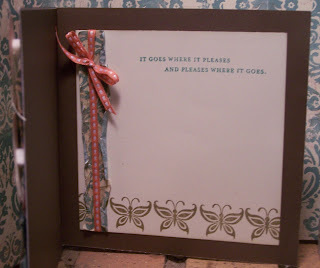 I used glue dots to adhere corners. one of the most AMAZING women I know was born! She was Clara Mae King, a.k.a. "Me-Me" to me and my cousins. She mothered FOUR BOYS including one set of TWINS (my daddy being one of them). When I think I have it rough with THREE BOYS, I often think of her and how she did it with cloth diapers and no running water in the house. 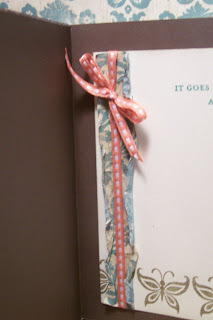 She is also a HUGE reason I love scrapbooking, card-making and paper-crafts. I would go spend weeks at a time with her and we would alter boxes, sew, paint, anything I wanted to do, she would allow me to and be right there to teach me. 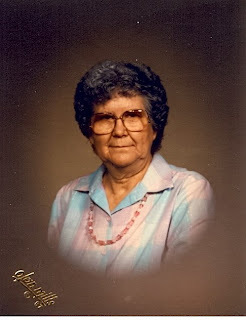 She's been gone 9 years already and I miss her TREMENDOUSLY!!! I wish she was here to share my passion of scrapbooking and give me advice on living in a house full of boys!! Did you know that she saved EVERY SINGLE card anyone ever gave her (I know because we had to go through them all when we cleaned out her house)....I wish I could send her one of my handmade cards right now! Happy Birthday, Me-Me....I LOVE YOU and I MISS YOU!!! 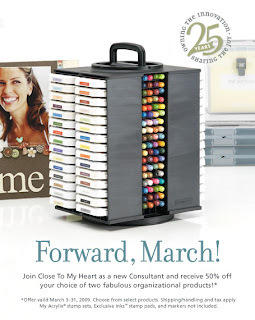 Join Close To My Heart as a new Consultant during March and get 50% off your choice of up to two organizational products! Check out my side-bar for more information!!! 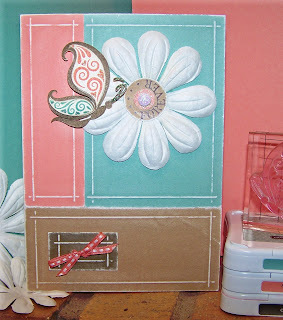 This is a card for a virtual swap I'm in for the Stamp of the Months. 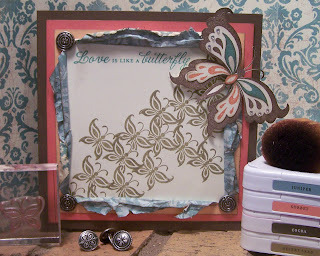 This stamp set happens to be Butterfly Wings and is the SOTM for March. 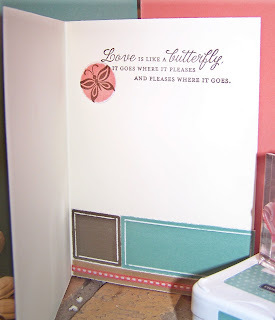 I'm really not a butterfly person but this was a fun card to make....so fun, in fact, I may become a fan of these little critters. Close-up of Butterfly and flower from Big Pinks.